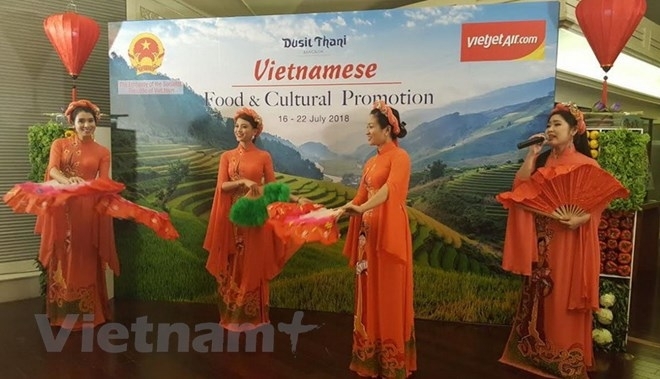 A Vietnamese Food and Culture Promotion Week was launched in Bangkok, Thailand on July 16 in the presence of representatives from foreign embassies in Bangkok, international guests and the Vietnamese community in Thailand. 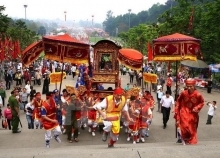 The event, which will last until July 22, is being held by the Vietnamese Embassy in Thailand, in collaboration with Thai Vietjet Air, an affiliate of Vietnam’s budget airline Vietjet Air, and Dusit Thani Hotel. Addressing the opening night on Monday, Vietnamese Ambassador to Thailand, Nguyen Hai Bang, stressed that food is a unique feature of Vietnamese culture, and Vietnamese cuisine has found global appreciation for its nutritional and cultural values. He highlighted the fondness of the international community for Vietnamese dishes, while stating that Vietnamese cuisine has been advertised in many countries around the world, and Vietnamese food restaurants in Thailand always attract large crowds of diners. The diplomat expressed his hopes that the Vietnamese Food and Culture Promotion Week in Bangkok would help to strengthen the understanding of Thai people and international friends about Vietnam and its people through sampling the country’s most famous dishes. Participants in the opening night had the chance to enjoy the tasty Vietnamese dishes directly prepared by Bui Van Dam, a chef from Ho Chi Minh City, in addition to the interesting dances and musical displays performed by artists of “Hon Viet” (Vietnamese Soul), a troupe from the Vietnam National Academy of Music. An exhibition featuring paintings produced by Thai artists of Vietnamese descent was also launched by 333 Bababa Gallery on the occasion.